These handmade brushes feature an engraved Grafilo grip for superior handling and flexibility and gold tone brass ferrules. All are made with pure male Tajmyr Sable Kolinsky, the finest hair in the world of natural brushes. Known for its springiness, this shiny, light brown hair from northwestern Siberia stipples perfectly and has an incredible capacity for retaining liquid. It is ideal for both oil and watercolor. 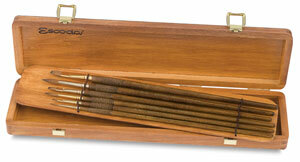 Brushes come packaged in a distinctive wooden box. This six piece set includes three Series 2420 rounds in sizes 2, 6, and 10, and three Series 2920 brights in sizes 4, 8, and 12.